Approved by the Great Kerfuffle Society for Approving Things Oi! You at the back! Yes, you! Stop mucking about and get a move on. Some of us are waiting to get going on this quest you know! 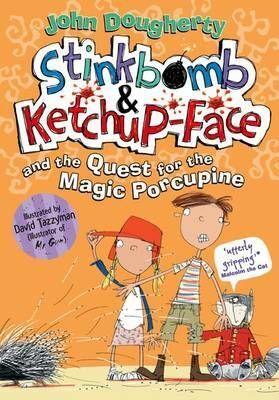 These magic porcupines are pretty hard to find, so pay attention and stick with our fearless heroes, Stinkbomb and Ketchup-Face. It could take many years for us to finish our gigantic quest, or it could take just under 200 pages, but I'm pretty sure we'll be back in time for tea, 'cause we'll be starving by then ...With a host of unforgettable characters such as ...ummm ...old what's her face and ...errrr ...young fellow-me-lad, this is nail-biting and thumb-sucking adventure that will leave you laughing and cheering and quite possibly really fancying a banana!